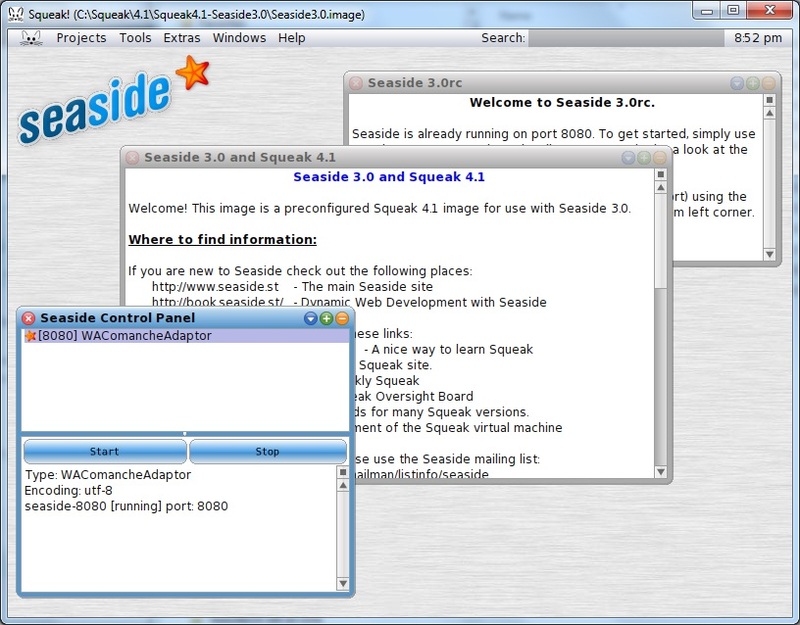 Oh, and if you want to load Seaside 2.8 / 3.0 into your custom Squeak variants; the above images include instructions about how they were created so you should be able to apply the same procedure to your own images. I’ve just released a bit of work that I had been working on for a while. SqueakSSL is a plugin based interface to the native SSL/TLS facilities on your platform. On Windows, it uses the SChannel SSPI and on Unix it uses the OpenSSL implementation. The Mac’s still out there but I’m hoping that the OpenSSL version will work there too. I just released WebClient and WebServer 1.0 for Squeak 4.1. This project started about half a year ago when I realized that I had just written the third almost-but-not-quite complete HTTP server implementation internally. The thing is, HTTP servers and clients are tremendously useful. Having a small and compact implementation offers all sorts of interesting uses. For example, we use HTTP as command and control interface for various backend server aspects; be that generating status XML for processing by a front-end php app, or profiling of the live application, or RTSP handling, or server-to-server communication. Given all these interesting simple applications I figured it was about time to write a simple general purpose HTTP server (yes, Kom, I’m looking at you). While writing it I quickly noticed that I need an accompanying client since HTTPSocket was just too awful for testing. It’s incomplete, inconsistent and broken in lots of interesting ways. The good thing is that since both client and server share much of the representation, the overhead is very small. As a result, we now have what I think is a pretty decent HTTP server and client implementation for Squeak 4.1 and hopefully we can nuke HTTPSocket sometime soon. WebClient is superior in every respect. The project is hosted on Squeaksource. This got me thinking. We know a lot about measuring complexity, it may be true that we can’t put an absolute measure on simplicity, but I’m sure we can measure relative simplicity a whole lot more than “coolness”. Let’s give it a shot. First, we need a measure of simplicity and I’ll suggest to use the number of entities involved. That seems like an obvious and straightforward measure. Something that is constructed out of 5 parts is probably simpler than something that is constructed out of 50. A program with 900 LOC is probably more similar in complexity to a program with 1100 LOC than a program consisting of 50 kLOC. A library exposing 30 classes is probably simpler to use than one exposing 100 classes and a class with 15 methods is probably simpler than one one with 30 methods. There will be exceptions but as a rule of thumb it seems like a good first order approximation. Implementation Simplicity, measuring how many entities we need to understand how the software does it. As an example for these dimensions, let’s consider Smalltalk execution semantics. The conceptual model is quite simple, linked frames that are stored in the heap (a more detailed explanation is here). The interface isn’t quite as simple, there are several classes and many operations (push, pop, temp access, reflection etc) involved. The implementation, in particular when trying to implement the model efficiently, can be highly complex (check out Eliot’s comments on context to stack mapping in Cog). Now that we’ve got both a value as well as dimensions to look at, let’s apply our measures to see if simplicity can’t be a reasonably precise measure. I’m going to compare MVC and Morphic which are both UI frameworks in Squeak and I’m going to compare the versions in Squeak 4.1 specifically. In terms of conceptual simplicity, MVC has three entities (Model, View, and Controller) whereas Morphic only has a single entity (Morph). That’s a clear win for Morphic, conceptually, it is simpler than MVC. In terms of interface simplicity there can be no doubt: With 324 Morph classes and 128 Controller+Model+View classes MVC wins hands down in Squeak (the actual ratio is much worse since this counts all of the tools which are subclasses of Model for historical reasons). And again, anyone who has used both will probably agree, that MVC in Squeak has a simpler interface even if it is more complex conceptually. For the implementation of both MVC and Morphic we can use the same values which hands victory to MVC. As a result of applying our measures to Morphic and MVC we get a pretty good idea of relative simplicity along various dimensions. It’s not an “exact” measure, and it’s not an “absolute” measure but it is a measure that allows us to compare and contrast software and measure its relative simplicity. PS. The facade pattern is a great example for explicitly increasing interface simplicity of some subsystem. Preferences. Packages often want to show preferences in the standard preferences tools. File services. Packages that provide services to operate on files, need to register these. Menu items. Packages providing UI elements want to register these with the proper menus. Etc. I think you can see where this is headed. Every time something changes, we must update our code to play with the latest changes in the underlying system. It is our responsibility to make sure that the code doesn’t break, making it necessary to adapt the code to any changes going on. The question is: How can we fix that? How can we avoid breaking such extensible services in the first place? The answer: Method annotations (“pragmas”). They provide an excellent way to discover services provided by a class. Instead of having the class “patch” the system (i.e., via calling methods on various registries directly) the system “discovers” the service provided by a class through the use of annotations. At this point I need to apologize since I’m shifting gears. The (real) examples above were taken from FileList because that’s where the problems occurred but down below I’ll be using preferences to illustrate how annotations solve the service discovery problem. That’s because we have only implemented them for preferences and so that’s what I’m using here. balloonHelp: 'Use the system locale to set the system language etc at startup'. newID := self current determineLocaleID. Basically, all preference uses were hardcoded to go through Preferences with a very rich (friendly for “bloated”) interface for manipulating preferences. The implementation was then tied into various UI aspects making it virtually impossible to simplify or decouple them. The first thing to notice is that in the client code we’ve put away with an explicit representation for “Preferences”. A preference, as far as a package is concerned is simply a value that you would like to be settable by the user. You can always get and set the value by asking Editor for its #blinkingCursor value – the fact that this value should also be shown as a preference is orthogonal to its existence as a value all in itself. Secondly, the declaration abstracts away any dependency on the implementation. Any code that deals with preferences and sees this annotation has all the information it needs to present the preference to the user. As a consequence, the only code that is here is the actual domain code – there is no code that deals with the concept of “preferences” in any way. In fact, there may not even be a preference implementation in the system. Thirdly, using an annotation this way is shifting the burden from the package maintainer to the system maintainer. The package maintainer is no longer required to update their package for each and every Squeak version – it is the task of the system maintainer to implement the service discovery in the proper form. The scheme described here extends naturally to the other uses mentioned above. In each case we have a “domain action”, be that setting a value (for preferences as in “Editor blinkingCursor”) a method invocation (for a menu, say “Browser open”) or a file operation (for the file list, “SampledSound playWaveFileNamed: …”) that the package provides. In each case we have some additional form in which we’d like to provide that service to the system (via preferences browser, menus, file list operations) and in each case we can announce the availability via an annotation that is discovered by the system. As a consequence, everyone wins. The package maintainer wins because she has less work to do, deals only with domain code and gets backwards (by backporting the discovery) and implied forwards compatibility. The system maintainer wins because they get the freedom to change core parts of the system without fear of causing undue breakage. A classic win-win situation. Hi there. I’ve always needed a blog for some of my very own comments on Squeak and the rest of the world, I finally gave in and started this one.